(Newser) – In a global industry plagued by fraud and deceit, conscientious consumers are increasingly paying top dollar for what they believe is local, sustainably caught seafood. But even in this fast-growing niche market, companies can hide behind murky supply chains that make it difficult to determine where any given fish comes from. That's where national distributor Sea To Table stepped in, guaranteeing its products were wild and directly traceable to a US dock—and sometimes the very boat that brought it in. However, an AP investigation found the company was linked to some of the same practices it vowed to fight. Preliminary DNA tests suggested some of its yellowfin tuna likely came from the other side of the world, and reporters traced the company's supply chain to migrant fishermen in foreign waters who described labor abuses, poaching, and the slaughter of sharks, whales, and dolphins. The New York-based distributor was also offering species in other parts of the country that were illegal to catch, out of season, and farmed. 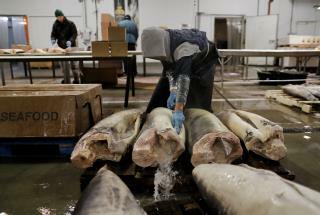 As part of its reporting, the AP staked out America's largest fish market, followed trucks, and interviewed fishermen who worked on three continents. During a bone-chilling week, they set up a camera that shot more than 36,000 time-lapse photos of a Montauk harbor, showing no tuna boats docking. At the same time, the AP worked with a chef to order fish supposedly coming from the seaside town. The boat listed on the receipt hadn't been there in at least two years. "It's sad to me that this is what's going on," says celebrity chef Rick Bayless, a Sea To Table client. He says he loved the idea of being directly tied to fishermen—and the pictures and "wonderful stories" about their catch. "This throws quite a wrench in all of that." All flesh companies lie. Go vegan. i hate stories like this, they are accurate, honest, true..we see them over and over and over yet nobody is ever charged or sent to real prison. i won't buy frozen from big box stores, it's all from china, our new best friend. and now maybe from n korea poisoned ponds. Yeah I remember deal with traveling salmon. That was so dumb.